Thank you so much for being the first ISTE executive or board member to address the sad state of affairs expressed by my old friend and mentor David Thornburg. It is disappointing that David’s proposal was rejected. Dr. Thornburg is a pillar of educational computing. I am grateful to David for bringing attention to ISTE’s non-existent response to the life and death of Seymour Papert. It is worth noting that the father of our field, Dr. Papert, was never invited to keynote ISTE or NECC; not after the publication of his three seminal books, not after the invention of robotics construction kits for children, not after 1:1 computing was borne in his image in Australia, not after Maine provided laptops statewide, not when One Laptop Per Child changed the world. This lack of grace implies a rejection of the ideas Papert advocated and the educators who had to fight even harder to bring them to life against the tacit hostility of our premiere membership organization. One would imagine that a conference dedicated to linoleum installation would eventually have the inventor of linoleum to address its annual gathering. Last year (2015), ISTE rejected my proposal to lead a session commemorating the 35th anniversary of Papert’s book Mindstorms and the 45th anniversary of the paper he co-authored with Cynthia Solomon, “Twenty Things To Do with a Computer.” See the blog post I wrote at the time. Such indifference was maddening, but the failure of the ISTE leadership to recognize the death of Dr. Papert this past July, even with a tweet, is frankly disgraceful. After Papert’s death, I was interviewed by NPR, the New York Times and countless other news outlets around the world. I was commissioned to write Papert’s official obituary for the prestigious international science journal Nature. Remarkably, unless I missed it, ISTE has failed to honor Dr. Papert in any way, shape, or form. I have begged your organization to do so in order to bring his powerful ideas to life for a new generation of educators. These actions should not be viewed as a grievance or form of attention seeking. ISTE’s respect for history and desire to provide a forum for the free exchange of disparate ideas are critical to its relevance and survival. Dr. Papert himself might suggest that ISTE is idea averse. In its quest to feature new wares and checklists, it neglects to remind our community that we stand on the shoulders of giants. Earlier this year, I was successful in convincing NCWIT to honor Papert’s colleague, Dr. Cynthia Solomon, with its Pioneer Award. If only I could be so persuasive as to convince ISTE to honor the “mother of educational computing” before it’s too late. As we assert in our book, Invent To Learn, without Papert and Solomon there is no 1:1 computing, no Code.org, no CS4All, no school robotics, no maker movement. In light of Papert’s recent passing, and the remarkable 50th anniversary of the Logo programming language in 2017, I submitted two relevant proposals for inclusion on the 2017 ISTE Conference Program. You guessed it. Both were rejected. Anniversaries and deaths are critical milestones. They cause us to, pause, reflect, and take stock. In 2017, there are several major conferences, including one I am organizing, focused on commemorating Papert and the 50th birthday of Logo. Sadly, ISTE seems to be standing on the sidelines. It is not that I have nothing to offer on these subjects or do not know how to 1) write conference proposals or 2) fill an auditorium. As someone who has worked to bring Papert’s powerful ideas to life in classrooms around the world for 35 years and who worked with Papert for more than two decades, I have standing. I edited ISTE’s journal dedicated to the work he began, was the principal investigator on Papert’s last major institutional project, gave a TEDx talk in India on his contributions, and am the curator of the Seymour Papert archives at dailypapert.com. I worked in classrooms alongside Seymour Papert. Last year, 30 accepted ISTE presentations cited my work in their bibliographies. I am often asked why I don’t just give up on ISTE. The answer is because educational computing is my life’s work. 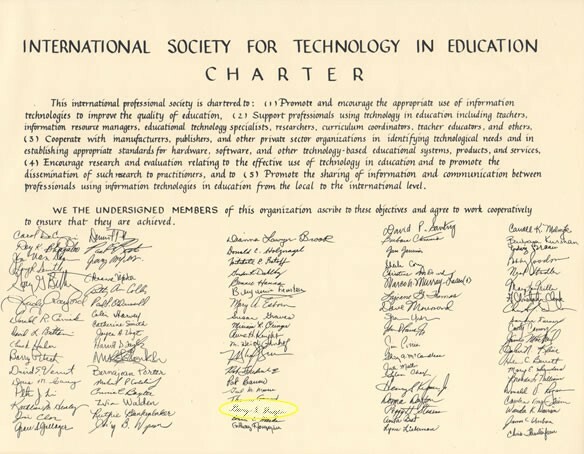 I signed the ISTE charter and have spoken at 30 NECC/ISTE Conferences. It is quite possible that no one has presented more sessions than I. 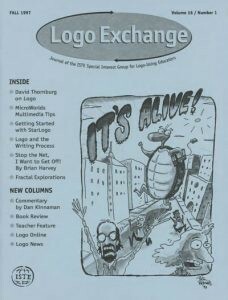 For several years, I was editor of ISTE’s Logo Exchange journal and founded ISTE’s SIGLogo before it was killed by the organization. I have been a critical friend for 25 years, not to harm ISTE, but to help it live up to its potential. For decades, David Thornburg and I have spoken at ISTE/NECC at our own expense. This is just one way in which I know that we are both committed to what ISTE can and should be. I have also written for ISTE’s Learning and Leading with Technology. It would be my pleasure to discuss constructive ways to move forward. PS: Might I humbly suggest that ISTE hire or appoint a historian? Gary Stager is an award-winning teacher educator, edtech pioneer, speaker, & co-author of Invent To Learn: Making, Tinkering, and Engineering in the Classroom.